Did President Trump invoke the 25th amendment of the U.S. constitution to expel Speaker Nancy Pelosi from congress? No, that's not true: It is a fake story posted on a website published on the Blogspot hosting service. The U.S. constitution has no provisions that allow a president to expel a house speaker. The story also includes a fake quote purported to be from the article 5, which it claims was "written by Ben Franklin in 1788." While Franklin was a delegate to the Philadelphia convention that wrote the constitution, he was elderly and in poor health. While he played a role in shaping "the great compromise" that formed congress, he did not write article 5. 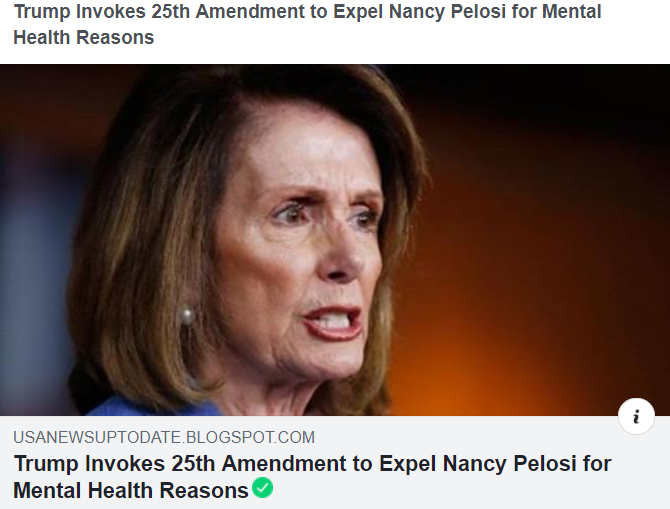 "Sub-section 34: No member of Leadership, be it the President, Vice President, Speaker of the House or Senate Pro Tempore, is exempt from mental health evaluation and concern. In particular we pay attention to dementia and the over-use of the poppy, absinthe or cannabis. Upon unanimous vote of the Cabinet, that leader shall be replaced by the next in the line of succession." Nothing in article 5 references "poppy, absinthe or cannabis," or dementia. In fact, the article relates to how the constitution can be amended by congress and the states. The 25th amendment addresses only the "removal of the president," and has nothing to do with removing a house speaker. The speaker can only be removed by a vote of the majority of the members of congress, something that is done every time a different party takes control of the house. Speaker Pelosi was removed from the post after Democrats lost the congressional majority in the 2012 mid-term elections. She returned to the position when Democrats regained control in the 2018 mid-terms, replacing Speaker Paul Ryan. The hoax story also claims that Secretary of Education Betsy DeVos will become house speaker with Pelosi's ouster. Nonsense. There is no provision for a member of the executive branch cabinet to take over the house gavel under any circustances. Despite the basic obvious flaws with this story, comments under the post suggest many people believe it. An earlier iteration of the story appeared in February 2019 on Bustatroll.org, a site labeled as "satirical and conservative fan fiction." The satire has not followed the copycat versions. To learn more about Lead Stories' satire policy, click here.